When you farm land you don’t own, you must do your homework prior to getting on the land to ensure your business interests are protected. Spend the time needed to thoroughly understand the land. The landowner is not looking out for your interests. Ask good questions. All agreements must be in writing. Trust your gut. Farming leased land is the least expensive way for new farmers to start doing what they love best: farming. It’s also the best way for existing farmers to expand their operation. Western Washington lease rates range from as low as $200/acre to more than $1,000/acre. More expensive land has easier access to Seattle markets, reliable irrigation water, and housing. Less pricey land is prone to significant flooding or has contract clauses to quickly evict the farmer. This is the story of two farmers, Jake Sterino and Nicole Capizzi producing food on leased land in the urban fringe. Often landowners lease land in the queue for future development. Throughout most of the 20th century, the Puyallup Valley was home to large-scale farm businesses producing oodles of food. But cities grow, farmers age, and what was once rural land is threatened by encroaching cities. Farmland which is flat, cheap and easy to develop are targets for constructing urbanizing infrastructure. Classic is the future 6-mile extension of Highway 167 slicing through the lower fertile Puyallup River valley which has been slated for construction for 20 years, and the Port of Tacoma has it on its “must-do” list. The Washington State Department of Transportation (WSDOT) leases the agricultural land to a long-time Puyallup Valley farmer, Jake Sterino. Jake is uncertain when WSDOT will invoke its 90-day vacation clause, but with a $1.5 billion shortfall and no foreseeable construction funding, food production keeps on. Jake, as the fourth generation farmer continues his family’s almost 100-year old business farming the fertile soils bringing berries, lettuce, cabbage, celery and sweet corn to Puget Sound markets. Jake completes his yearly harvest season with the ubiquitous Halloween orb. 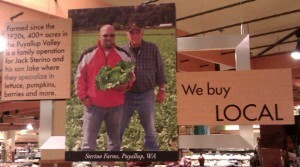 QFC, Fred Meyer, and Town & Country Markets feature Sterino Farms in store promotions, as a local Puyallup farmer. Do these retailers know the threats to this farmland? In the near term, highway construction in the Puyallup is stalled, but Jake has hedged his bets. He’s farming 100 acres in eastern Washington, too. Nicole Capizzi of Amaranth Urban Farm has created a smaller scale farm business on two tracts of urban land. She begins each season by renting early-season greenhouse space at Rainier Beach Urban Farms & Wetlands, a project of Seattle Parks & Recreation and Seattle Tilth. With pallets of starts, she begins her season in south Seattle, in a working class neighborhood beneath the flight path. Nicole farms a one acre irrigated property, in the midst of an in-city riding facility. The farmground sits uphill from the horse compound. She is fortunate to have covered barn space to store equipment and an open air gazebo to wash and sort produce. Delivery bins, abundantly filled with tender greens, heirloom tomatoes, winter squashes, and bouquets of color, are delivered three times a week to her CSA, co-op, and restaurant customers. Nicole tills another one acre parcel incorporated into Heritage Farm Thoroughbred Training Center in Kent. King County had the foresight in 1984 to preserve Heritage Farm as agricultural open space, in what is now surrounded by a burgeoning suburbanizing community. To the south, suburban Kent neighborhoods abut the farm. In 2009 Tukwila annexed the last undeveloped 500 acres in the northern Kent Valley anticipating construction of neighborhoods and businesses creating 25,000 jobs over the next 25 years. This leaves the 30-acre Heritage Farm property a future rural oasis in the middle of these two growing cities. In the meantime, the area around the farm is still pastoral. Surrounded by youngsters learning horsemanship on the riding ring, Nicole cultivates crops in this small section of what was once an immense agricultural valley. With less than 10 miles from farm to table, produce is super fresh ensuring full nutritional benefits to the eater. 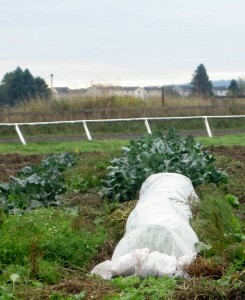 Harvested food from this farm is brought back to the Seattle farm for washing, sorting, and processing. I was fortunate to meet Nicole when she was searching for the piece of land to create her dream as an urban farmer. To see her accomplishments is gratifying, but I know there were many hours of effort behind her success. Likely, the small scale urban farm is replicable, but, as Nicole says, “If we are really going to create this robust local, just, secure food system everyone is talking about, some of us are going to have to be the professionals (farmers) who actually do the work.” Jake and Nicole are compelled to labor in the eternal enterprise of growing food, ensuring our plates are filled with plentiful produce. Despite being on leased land, we are blessed with their bounty and perseverance.